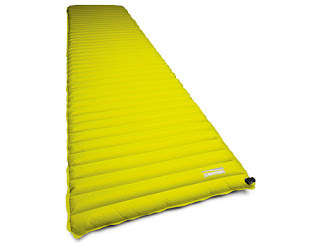 The Therm-a-Rest NeoAir mattress packs to the size of a one litre bottle and weighs only 14 ounces for a regular size, making it the perfect choice for people with strict weight and space limitations. When inflated, the NeoAir mattress is warm to sleep on, thanks to a patent-pending Reflective Barrier that reflects heat back to the user’s body and reduces convective heat loss to the ground. A second patent pending technology, the Triangular Core Matrix, contributes to the warmth by creating a multitude of air cells that minimize air movement and convective cooling. This matrix also creates an internal truss system that virtually eliminates the instability generally found on large tube-based air mattresses and assures that the user will shift less while resting comfortably on a 2.5 inch-thick mattress. Since thermal efficiency is achieved without the aid of down or fibre insulation, the NeoAir mattress can be blown up directly, without the added weight of an air pump or having to worry about exhalation moisture wetting insulation and decreasing performance. 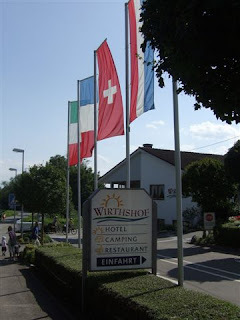 If you're planning a camping trip abroad next year, do not leave changing money until you arrive at the ferry terminal. Certainly, do not use the “handy” ATMs in the UK that offer euros as the combination of poor exchange rate, handling charge and commission is punitive. As most banks appear to resent you accessing your own money when abroad, consider changing to a bank that makes no extra charges for what so many regard as a privilege. A little forward planning and shopping should mean that you can avoid buying a 'European Road Safety Kit' on a ferry, usually on sale at a ridiculous price. You could enjoy a Blue Peter evening making your own reflective gilets and share the use of other items such as a warning triangle, light bulbs and so on with friends. Shop around for a good family deal on travel insurance. Annual cover is often a much better option rather than taking out insurance for each trip. Don't forget to arrange a European Health Insurance Card (EHIC) for everybody - www.nhs.uk. Breakdown assistance is priceless when you hit a problem abroad. The annual charge could turn out to be an absolute bargain and could salvage a holiday. 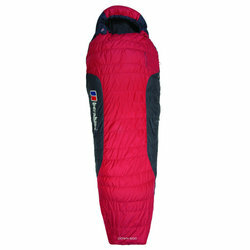 Berghaus has a range of tents and sleeping bags available in partnership with the Blacks Leisure Group. The tents vary in capacity from two person to six person. All of the products use high quality materials and offer excellent protection from the elements combined with great functionality and practical storage and carrying options. 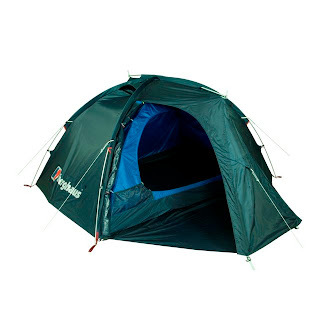 With a suggested retail price of £129.99, the two person Snowdonia 2.1 tunnel tent is expected to be popular and is ideally suited for multi-day backpacking trips. 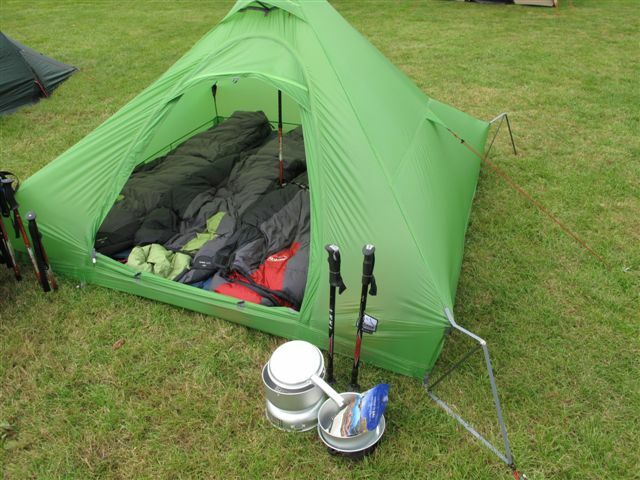 At the other end of the scale, the Torridon 6.2 has a pod dome design, two inner tents and a fully sealed groundsheet. Designed for up to six people, at £399.99, the Torridon is a fully featured family tent. Other tents in the range include: the Peak 2.1, a two person dome tent at £119.99; the Lomond 3.1, a three person tunnel tent at £249.99 and the Cuillin 4.2, a four person family tent at £349.99. The sleeping bag range is made up of a three season down bag, a four season synthetic bag and a one to two season synthetic bag. All of the bags are made with a nylon outer fabric and come with a compression stuff sac. Designed for three season use in a range of outdoor activities, the Berghaus Flame 600 retails at £139.99 and uses 600 fill power 90/10 goose down in a box baffle construction. The bag weighs 1298g. At £99.99, the Berghaus Flare 1600 is a synthetic fill alternative to the Flame. The Flare uses Berghaus’ AT Fibre Fill and its HEAT (Honeycomb Engineered Advanced Thermals) technology to maximise its thermal efficiency, and weighs 1654g. Both the Flame 600 and Flare 1600 incorporate an ergonomic shaped footbox to maximise heat retention around the feet. The one to two season Flare 850 is a rectangular synthetic fill bag, using Berghaus’ own AT Fibre Fill insulation and is designed for camping on warmer nights and for travel. The Flare 850’s rectangular shape gives greater freedom of movement and it retails at £59.99. Last winter brought large areas of the country to a standstill for weeks on end and kept large sections of the population housebound for fear of injury from the treacherous conditions underfoot. With Yaktrax, walking on packed snow and ice will give you the same solid, predictable grip you are accustomed to feeling on dry surfaces. Yaktrax is a unique, patented, compact, lightweight traction device that simply fits neatly over whatever shoes you want to wear and is held in place by an injection moulded thermal plastic elastomer. 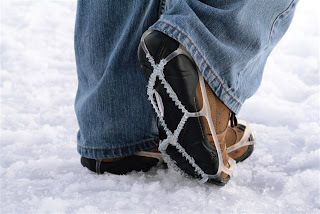 The scientifically engineered coil design is protected against rusting and will give you reliable traction as the hundreds of biting edges come into contact with the ice and packed snow beneath your feet. The Yaktrax Walker retails at £15 and the Yaktrax Pro, with an extra strap across the instep, at £20 and they are available in four different sizes from most good outdoor retailers in the UK. Terra Nova Equipment, the Derbyshire-based manufacturer of superlight backpacking and mountaineering equipment, has been presented with a prestigious award by the Outdoor Writers and Photographers Guild. Terra Nova’s Laser Photon (pictured in foreground), said to be the world’s lightest double-wall tent, has won the Outdoor Writers and Photographers Guild’s Derryck Draper award for innovation in the outdoors. Weighing only 64gms, the Princeton Tec Byte head torch is lighter and smaller than its big brothers, the Remix and the Fuel, but doesn’t compromise on performance thanks to its Maxbright LED of 30 Lumens. As well as its powerful capabilities, the Byte also has a softer side with its red Ultrabright LED, for when night vision and more subtle light is required. This ultra-lightweight and compact head torch completes the Family of Princeton Tec head torches, offering a miniature, yet powerful option within the range. As with all other Princeton Tec head torches, the Byte is equipped with an asymmetrical single armed bracket to allow infinite angle adjustment, easily accessible battery door enclosure and large push button switch for ease of use. For 2011, following the success of the Lite collection, Robens has launched the Xtra Lite collection, featuring the new HydroTex XTL fabric. The latest technical development in the Robens range, HydroTex XTL is a super strong fabric woven from a 20 denier yarn. The outer surface is coated in a silicone finish to ensure immediate water run-off whilst also providing additional strength. The inner surface has been treated with a PU coating to provide total waterproofing and durability as well as creating a surface that allows the seams to be heat-taped. 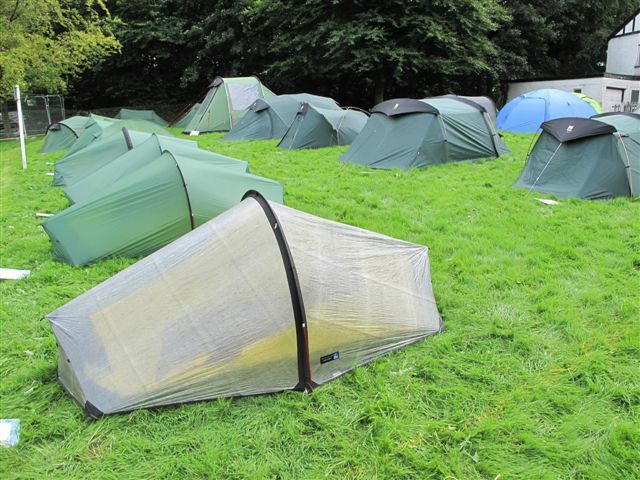 To ensure the lightest possible tents, every aspect has been researched, from the poles, to the webbing and materials, resulting in strong, durable yet featherweight tents. The Mythos Solo and Mythos Duo are one and two person lightweight tents; the external frame construction and easy clip system make them very easy to pitch whilst providing good stability. A well-thought-out vent system and a porch area in the Mythos Solo and a twin porch in the Mythos Duo are excellent for storage and they only weigh 1.37 kg for the Mythos Solo and 1.74 kg for the Mythos Duo. The Atmos is a cleverly designed two-person tent using trekking poles to pitch, weighing only 1.56 kg. The Stratos (pictured) is an extremely lightweight single skin tent which comfortably sleeps four people. It needs one pole to erect the tent, which is fitted internally and is located via the use of the unique Robens Fast-Foot cup; it weighs only 1.16 kg. A new collection of mats complements the range of down and synthetic sleeping bags. Robens also offers a tight rucksack collection, from the 55+ litre Trekker to a neat collection of rucksacks, including the feature-packed Havoc daypack, with an ingenious Air Flow Back system, rain cover, compression straps and plenty of pockets for versatile storage.